What’s happening on Saturday & Sunday? 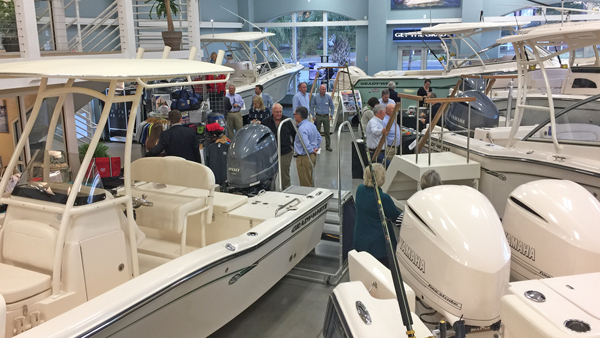 Boat Show Pricing: Combine our Atlantic Marine boat show discounts with manufacturer rebates and a free Yamaha extended warranty on every new boat purchased! We’ll also be ready to approve financing right away through our relationships with multiple lenders. Fishing Workshops (Saturday Only): Captain Stuart Caulder of Gold Leader Guide Service will be offering a series of short fishing workshops where you can learn what tackle to use, what techniques work best for your type of fishing, and the species of fish indigenous to our area! A schedule of workshops is posted below. Boat Handling Workshops (Saturday Only): Captain Kevin Hennessey of US Powerboat Training will offer a series of short boat handling seminars, lasting about 40 minutes each. Kevin will be available to answer your questions, talk one-on-one, or get you set up personal training on your boat. A schedule of workshops is below. Food: P.T.’s Olde Fashioned Grille food truck will be serving your favorite burgers and fries from 11:30am until 1:30pm on Saturday. Come hungry! Vendors on Site: TowBoat US, Garmin Marine Electronics, Cape Fear Power Squadron, and others will be here to make sure every questions is answered.